Handheld searchlights have a special place and role in the cockpit during night sailing. Traditionally, their key function is to alert another vessel to one’s presence, either by shining it onto a ship’s bridge (pretty desperate, but so is being run down!) 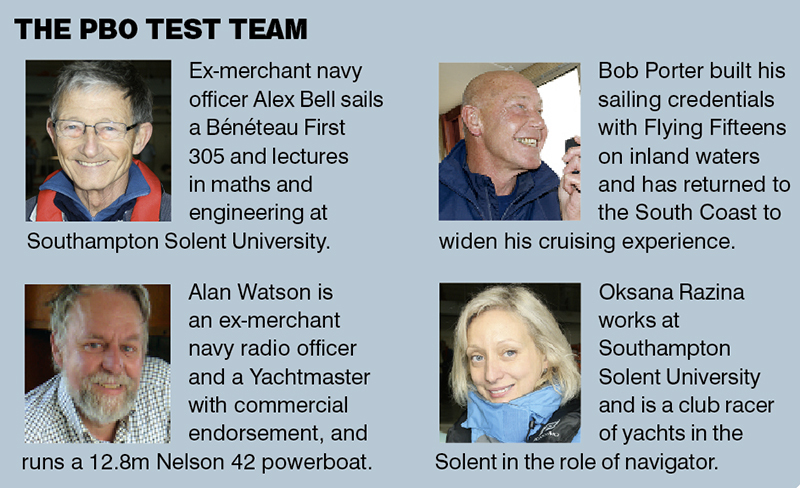 or, in a more friendly manner, shining it on one’s own sails to make it clear what and where you are. 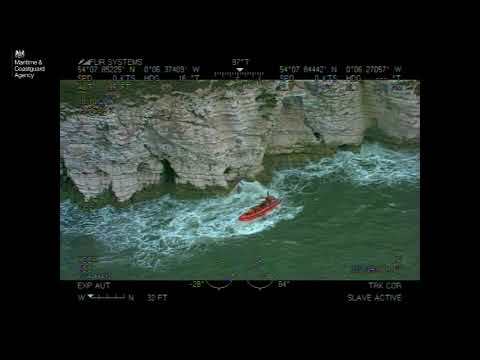 Other no less vital uses are searching for MOBs and looking for unlit marker buoys or posts when piloting river entrances. Coming into an anchorage in the pitch dark, making sure you don’t sail into a moored boat or run over a mooring buoy, is another situation requiring a searchlight, while a multitude of additional uses don’t require great range, such as illuminating a cockpit locker or acting as a deck floodlight. For this test we compared searchlights or spotlights sold by chandlers with those you can purchase from your local supermarket or Halfords. We compared LED with halogen and krypton bulbs, and also compared rechargeable batteries with disposable. The key requirements are sufficient range and spread to allow use as a portable searchlight, coupled with reliability and a long battery life. Preferably, there should be some kind of battery meter or warning lights telling us the battery is low and either needs recharging or replacing. Ideally, the lamp should float, which means it should also be waterproof: not for underwater exploration (which would put the cost up far too much), but for using in the rain or spray and taking the occasional dunking. Those with disposable batteries can take either AA, D cells or a lantern battery, so there is a choice. All can be purchased as rechargeable batteries: chargers are now available which will run off AC mains or 12V, making them more convenient for onboard use. Similarly, built-in rechargeable batteries should be capable of charging from either a 12V cigar lighter-type socket or AC mains. Some lamps offer different handle positions, pistol or suitcase grip, and some provide the ability to change from one grip to the other. Additionally, our testers tried them out for convenience of operation and ease of holding. Our range test consisted of using the lamps at night and seeing how far we could spot an object in the water. We used a football suspended over the water as our target. 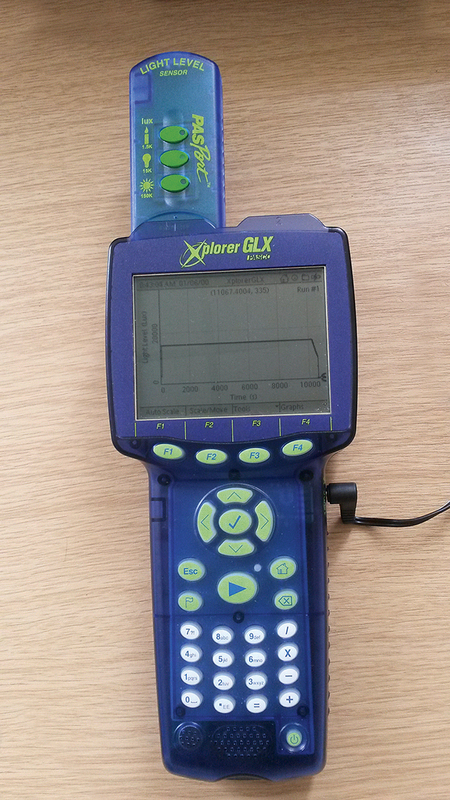 For the battery duration we used a data logger coupled with a light sensor. This was able to plot a graph of light strength in lux against time (seconds). Thus we were able to see how the battery performed over time. Comes in three sizes: 1M (as tested), 2M or 3.5M candle power, all with a quartz halogen bulb. The rechargeable battery is sealed lead acid. The handle has two positions, suitcase or pistol grip: selection requires a button to be pressed and the handle rotated. An adjustable stand enables the lamp to be angled in multiple positions between level and 45°. Charging can be from the mains or a 12V plug and takes roughly 20 hours using the mains adapter, but no more than two hours for the 12V car plug (recommended for a quick charge or emergencies). The lamp should not be used while the battery is being charged. It is important that the battery is not left discharged and should be recharged every three months even if the unit is not used. Comes with carry strap. ON TEST: Battery duration was a short 50 minutes, but beam range was good (100m). No pretence to be waterproof. Lead acid battery requires long regular charging, and there is no charge indicator light. A versatile handle and stable stand at a competitive price. 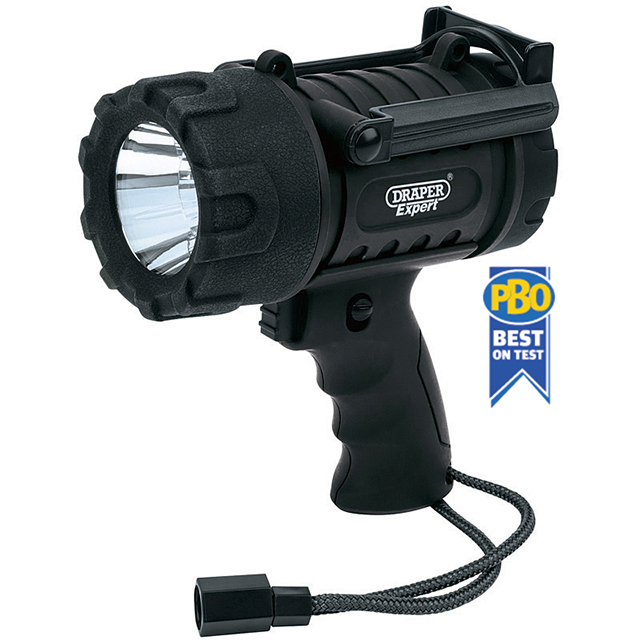 This rechargeable spotlight features an auto-discharge shut-off function to prolong battery life. Comes with a rechargeable lithium-ion battery: a red light flashes when the battery is low, then stays on when charging. When fully charged, a green light comes on. Charge time is approximately six hours, and it will operates for approximately three hours on one full charge. Supplied with mains charger only. The unit has a protection function which prevents the light being turned on while under charge. ON TEST: The lightest lamp tested, and very much a handy spotlight with the shortest range. The lithium-ion battery charges quickly and a light warns when it’s time for a charge, but it has a fairly short duration. Useful wrist lanyard. 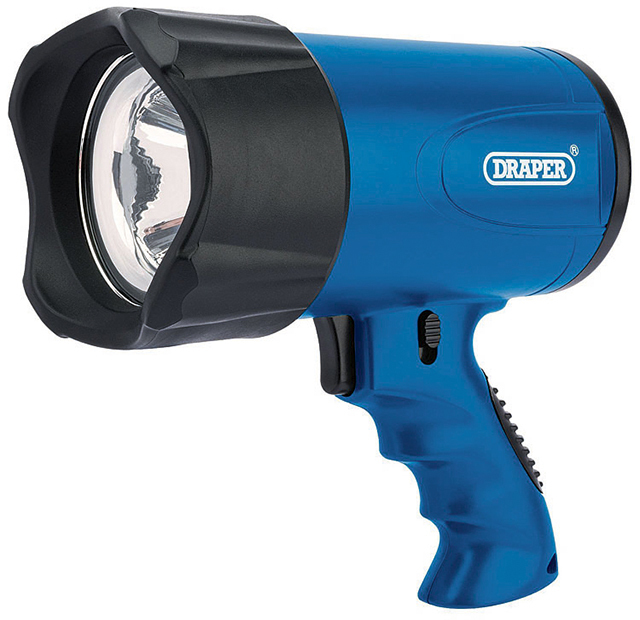 The only fully waterproof lamp from the Draper range has a single CREE LED. The waterproof and shockproof ABS casing has an IP66 rating so it is protected against dust and high-pressure water jets. The LED is powered by three AA batteries: range or duration time is not specified. With a fixed pistol grip and trigger switch, a second press puts the LEDs on a lower power, and a further press is required to switch the light off. The switch can be locked in the on or off modes. A stand enables the light to be set at varying angles from horizontal to vertical. A wrist strap from the pistol grip and a detachable shoulder carry strap are provided. A 6V lamp with an impact-resistant rubber housing and a krypton bulb. A swivelling stand offers six positions between horizontal and vertical. The handle is of the open suitcase type with the micro on-off switch conveniently located for thumb operation when being carried. Powered by non-rechargeable batteries, either four D-type cells or a lantern battery. The D-type cells made it the heaviest lamp tested. No range or battery life specified. ON TEST: Robust, weatherproof construction, very much the heavyweight on the test and with an unsteady stand. Good light range and a surprising battery life when fitted with extra-heavy-duty D batteries: the light reduced in intensity but was still useful up to 19 hours. Water-resistant casing. 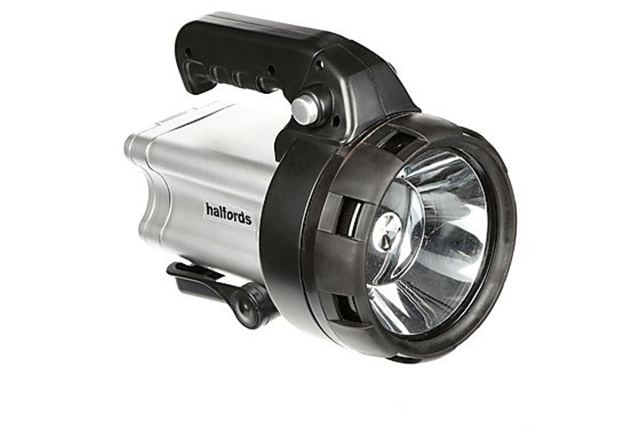 The Halfords-branded single LED spotlight claims one million candlepower or 120 lumens, a 170m range and an eight-hour duration from AA batteries as supplied or 40 hours from four D-size batteries. The clever battery holder will take four AA batteries and four D size at the same time. The on switch goes first to the D batteries, and the next press takes power from the four AAs. Loading with both battery sets makes the lamp heavy, but has the advantage that if the D batteries run down you still have another eight hours left from the AAs. Handle is suitcase or pistol grip: the change is made by pressing a button and rotating the handle. The operating switch is to one side of the casing. A bracket enables the lamp to be angled to four positions between vertical and horizontal. No claims to water resistance. ON TEST: Another heavyweight with very versatile battery capacity. Good light range coupled with long battery life, but not weatherproof. Excellent value. 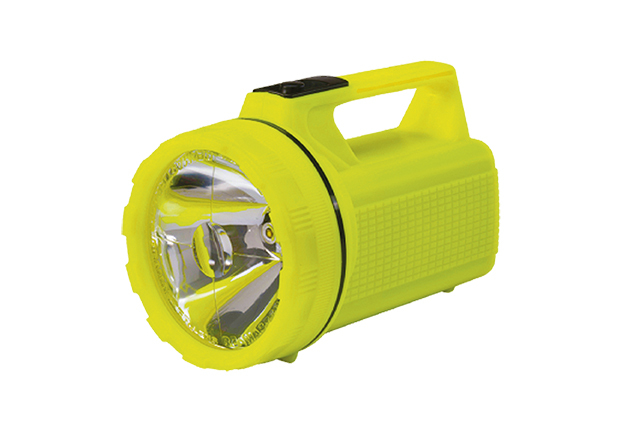 This weatherproof, rechargeable lantern has a super-bright 3W LED spotlight bulb giving up to 140 lumens. When fully charged (15 hours), the unit is claimed to operate for up to 18 hours. The two-position handle allows for open suitcase handle or pistol grip mode: a push-button facilitates change of position. The swivel stand offers five positions between not quite horizontal and vertical. The on/off micro-switch is at the left-hand side when in suitcase mode and becomes the right-hand side in pistol grip mode. A screwed cap protects the charging socket, which has an LED changing from red to green when the sealed lead acid battery is charged. Charging can be done by an AC mains transformer or a 12V lighter-type plug. Fully charged, the battery can be stored for up to three months and shouldn’t be left without recharging for longer than six months. ON TEST: A well-constructed body with a versatile handle and stand. One of the lighter weight models tested, with a shorter range and reasonable battery life. Lead battery requires regular charging. 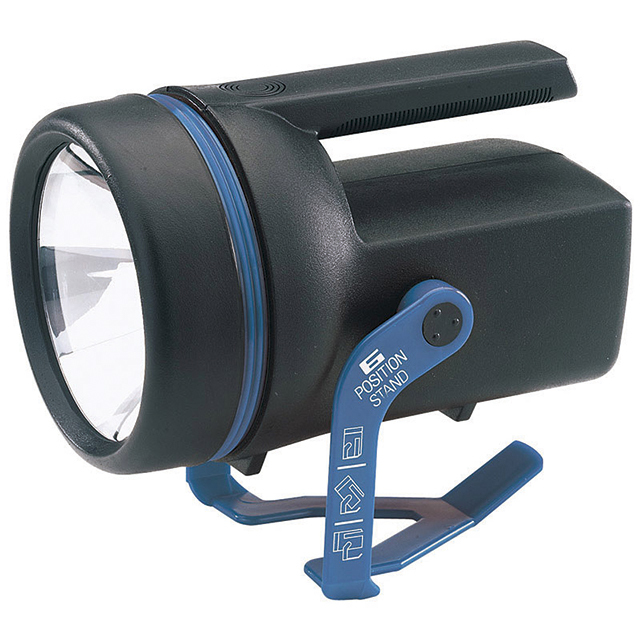 Available from Sainsbury and Tesco and supplied with four D zinc batteries, this makes a low-cost 13 LED spotlight. Comes with an enclosed suitcase handle, a wrist strap and a hanging becket. The rectangular shape enables it to rest horizontally on its base, but a slight 10° incline will cause it to roll over! Marginal as a searchlight, and could be weatherproof with a seal around the lens cover. ON TEST: In the spotlight category but with excellent battery duration, with standard alkaline batteries provided. Thin plastic casing means not heavy duty, but excellent value. Only the Unilite lamps are designed to float in water with the beam upright. This one has passed the ingress protection standard with a 56 category. A single LED puts out 200 lumens and is directed through a bi-convex lens giving a claimed range of 170m. The body has high impact resistance. Comes with a fixed suitcase-style closed handle and an attachment point for a wrist strap (not provided). Designed to take a disposable lantern battery (not supplied standard). 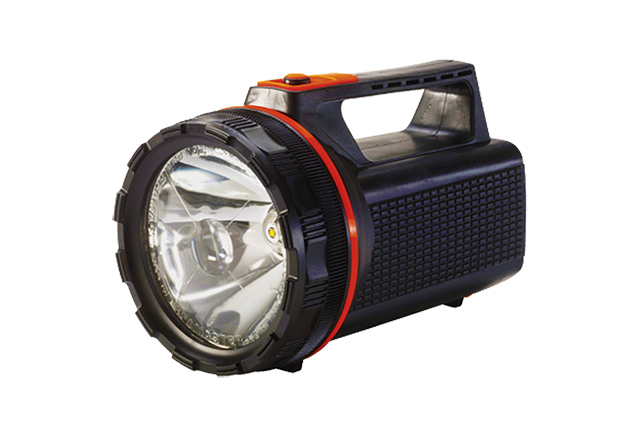 A rechargeable lantern battery is available as an accessory with a suitable charger. ON TEST: The second most popular lamp. Testers liked its waterproofness and robustness coupled with good range and long battery life. 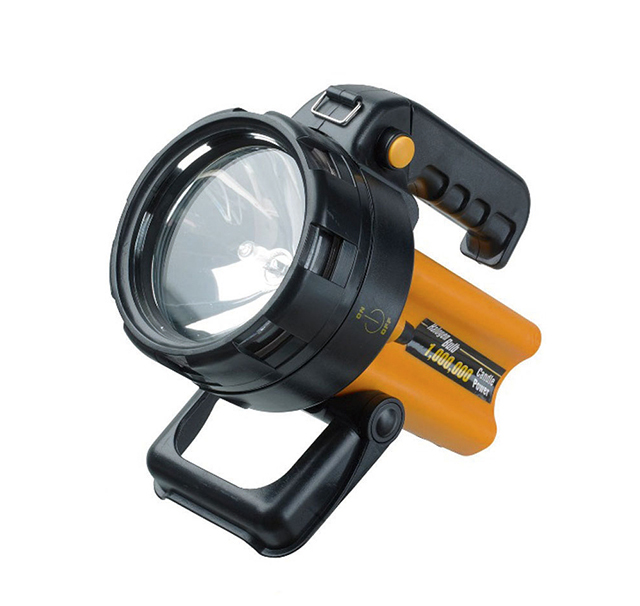 Has a similar light specification to the Unilite PS-L2, but with an extra-tough synthetic industrial-grade rubber casing claimed to withstand a 1m drop. Floats with the light shining upwards, and has a claimed beam range of 160m and run time of five hours on a lantern battery. Also comes with a rear charging point for use with Unilite rechargeable lantern batteries. Handle is closed suitcase type: no pistol grip option. Rubber casing is high friction so it resists sliding, but when resting horizontally on its base, it will fall over on a slope of around 15°. ON TEST: A robust, non-slip casing coupled with a good beam range and battery duration make this a worthwhile investment, though it is pricey and would benefit from not having the charging point access which creates a waterproofing weakness. Our four rechargeable batteries were either a sealed lead acid (B&Q Diall, Kingslite 3W LED) or lithium-ion (Blue Spot, Draper LED). The lithium-ion batteries have the advantage of a faster charge rate – typically five hours versus 15 hours for the lead acid – and weigh less, but with a price premium. 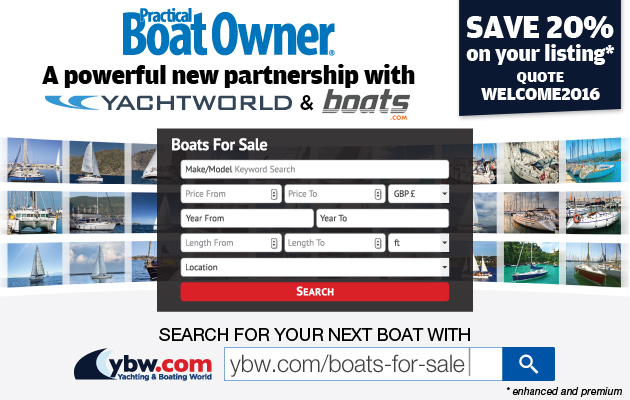 Both types require regular charging, so if left on a boat some sort of charging regime would require establishing, perhaps with a stick-on label to record charging dates. The high current demand from halogen and tungsten bulbs gives a short duration. Here the LEDs really score, giving much more useful battery life whether with rechargeables or disposables. Disposable batteries can be purchased with different capacities, with a premium price on the long-life variety such as Duracell. Most manufacturers offer long-life and even extra-long-life cells. The unit price comes down when purchasing larger pack quantities. D-cell and AA batteries can be purchased in rechargeable form, the majority now being Nickel-Metal-Hydride (NiMh). I use two in my Garmin 76 handheld GPS and they will last up to six hours of continuous use before requiring recharging. The situation we seek to avoid at all costs is the battery failing at a critical time in use. This is much less likely with LED bulbs. The advantage disposable batteries offer is the ability to quickly change to another set (providing you have them on board!). the incandescents’ yellowy colour, was very marked. Factoring in battery duration, it becomes a no-brainer. Most of these lights would fit into the ‘searchlight’ description. 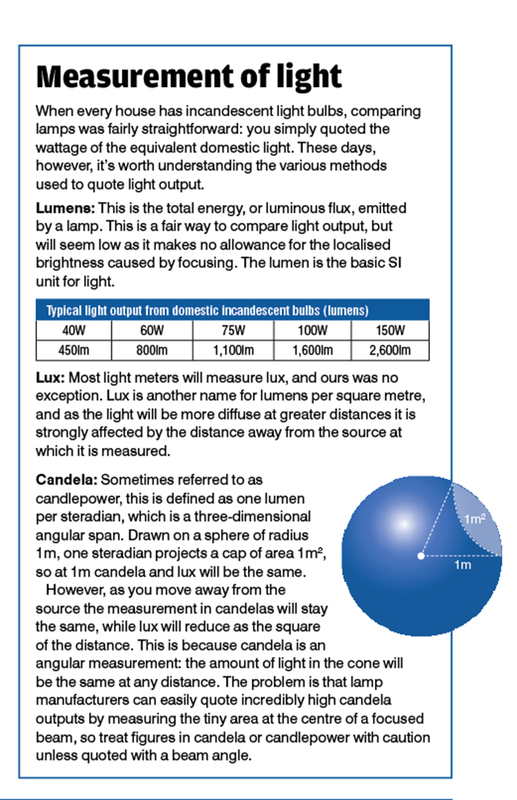 The Blue Spot is in the spotlight category lacking range, while the Draper 3W LED and RAC Heavy Duty are marginal. 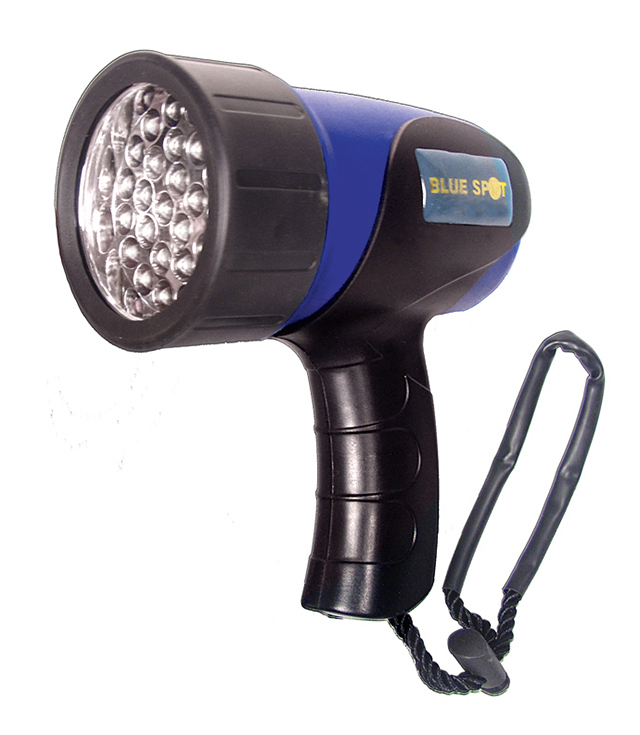 The Blue Spot makes a very convenient lightweight rechargeable lamp, although it only has one (horizontal) set-down position. 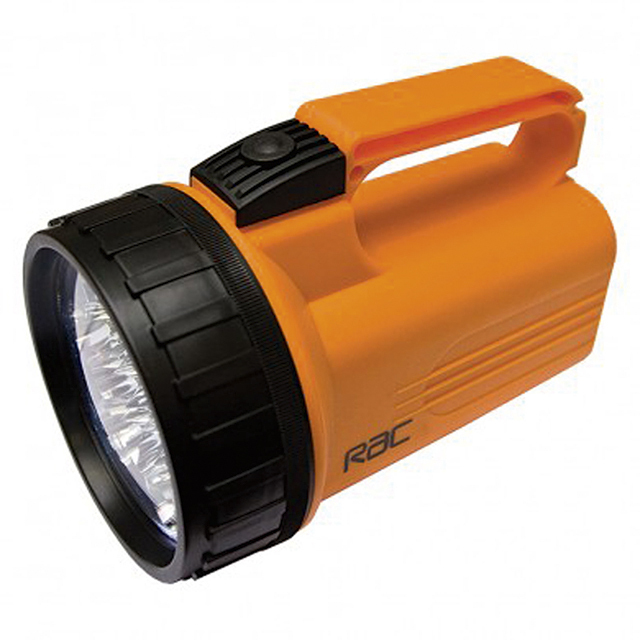 The RAC Heavy Duty is excellent value with an impressive battery life. When it comes to pistol versus suitcase grip, the pistol wins when used as a searchlight as it’s easier to point with one hand as you scan for your subject – so the versatile versions with a choice of handle positions do offer an advantage. Waterproofing/weatherproofing is also a big advantage when afloat. In this category the Unilite PS-L2 and Draper Expert 5W LED are the optimum products, followed by the Unilite HV-RL4 and the Draper RTL6. All the torches floated initially, but the non-waterproof ones would have filled with water and eventually sunk. At least if they were accidentally dropped in the water and quickly recovered, they might survive if rinsed in fresh water and dried off. With regard to battery choice, the life obtainable from disposable batteries, compared with the need to keep rechargeable batteries regularly charged, suggests that on balance the advantage goes with the disposable batteries, although they may be heavier than an equivalent capacity lithium-ion battery. 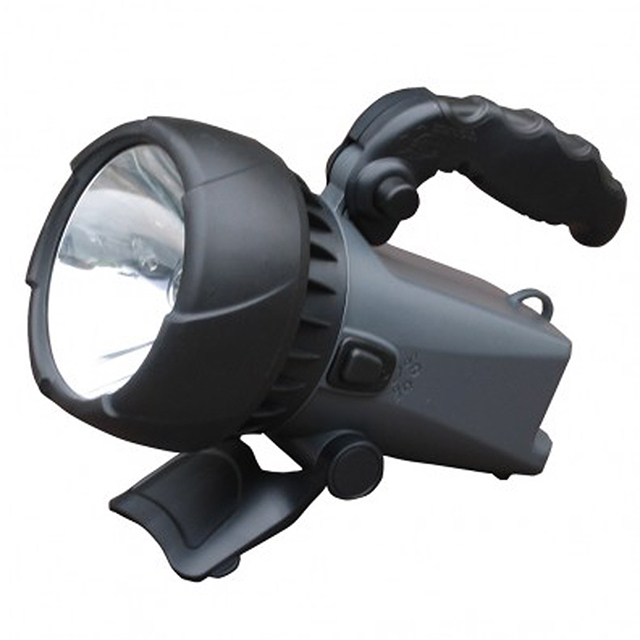 beam (albeit a fairly narrow one), is rugged, waterproof and the on/off switch can be locked. The Unilite LED Floating came a close second: it was heavier to hold, but although giving some light scatter from the lens, it provided a good beam in a tough casing.